The Boncuklu Project aims to excavate and study the archaeological remains of Boncuklu Höyük and interpret them for public and scholarly audiences. As well as producing scholarly articles and books, the Boncuklu Project is developing an on-site visitor centre and freely available information in Turkish and English for the wider public, tourists and school children. Working each summer from 2006, the project sees 2 months of fieldwork per year followed by work throughout the year in Turkey and international laboratories to identify and understand the remains found at the site. The project is giving us an important and exciting opportunity to investigate the reasons for the appearance of the first village farming communities in central Turkey and thus allows us to understand better the spread of farming through Anatolia into Europe. The development of villages and farming underpin our modern life. The house or home is a common denominator of modern human existence. For thousands of years humans had survived using hunting and gathering techniques. They had lived off wild animals and naturally occurring plant foods such as roots & tubers, nuts, berries and seeds. 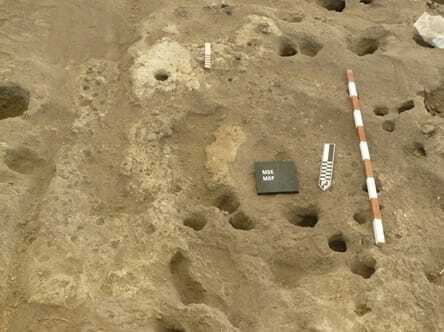 Settled life, based on farming, or the management of domesticated animals and the selection of domestic cereal varieties, developed 10-12,000 years ago and then spread from the Fertile Crescent of southwest Asia through other regions of Asia and Europe. The site of Boncuklu represents the earliest village on the Anatolian plateau and is dated to c.8500 BC/BCE which is 10,500 years ago. Boncuklu is also extremely significant because we have discovered some of the world’s earliest houses whose walls have painted clay and plaster relief decoration, including plastered cattle skulls (bucrania). These are some of the earliest decorated houses, preceding those at nearby Çatalhöyük by 1000 years. We are able to document the appearance of elaborate symbolic behaviour typical of the first settled villages and the antecedents of Çatalhöyük.